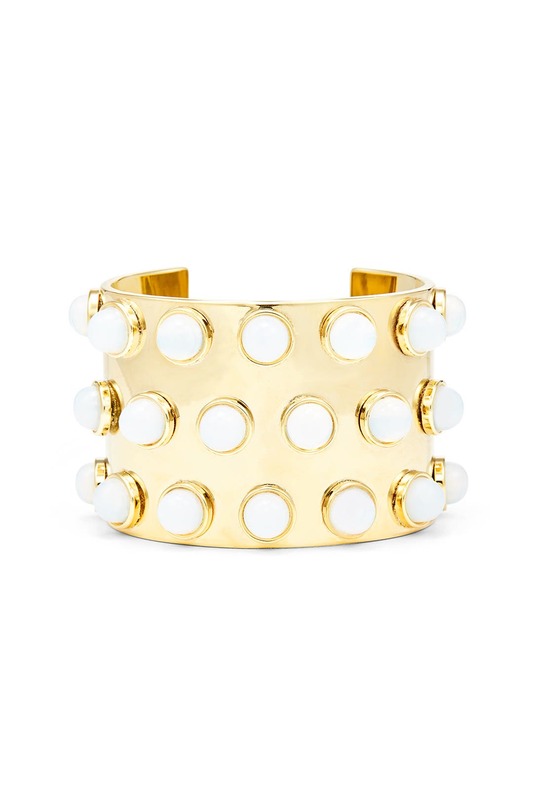 Moonstones give this modern cuff by Lele Sadoughi an earthy twist. Let it add some luxe dimension to a bohemian look. 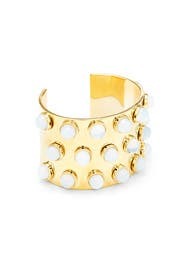 14K gold plated cuff covered with moonstone accents. 2.25" in diamater and a 1.25" opening. 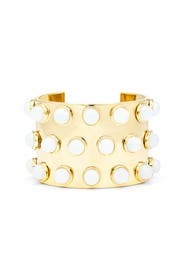 Beautiful, stunning cuff, but was really difficult to get on and off. Bling Bling. Hello Moon (stone)! The gold/brassy part is shiny. One of the stones popped out in transit, I popped it back in, but I was too scared to wear this and lose the stone. I am thinking that the piece had been bended to fit another wrist, it was snug on me and fit in a kind of deformed way. Which may just be a kind way of saying my wrists are chunky. This is fun and impactful and I would love to rent it again. It's inflexible and on the tight side so it rubbed a little on my wrist bone but not a deal breaker.